Yesterday morning I mentioned the zebra and showed a picture of him. Since I've spent a lot of time and effort getting the zebra, moving him around, getting him a new coat of color and finding just the right spot on the deck for him, I decided he might have more to tell me. The backstory: Almost four years ago, I was walking through my new neighborhood when I saw zebra sitting on a shady rock. I fell in love instantly and always enjoyed seeing him on my walks. But then the neighbors moved and left him behind. So I asked the new neighbors if they wanted him and they weren't sure. They left for a long while and he was out in the cold and rain so I zebra-napped him and left a check on the neighbor's door and told them to call me to bring him back or to keep the check if they didn't want him. They never called so he went with me to Arkansas and then Colorado. By the time we got back to California, he was in the sorry state you see here. Since I was working with Minarets High School, I asked the art teacher if any of her students would be willing to give him a face lift. She said yes and I donated some money for art supplies and he became a multi-colored zebra. When I looked online for "zebra medicine," I find that the primary message is individuality and balance and seeing in black and white, clarity without filters (see below for full message). Zebra's stripes protect him as he blends into his surroundings but also identify him since each zebra's stripes are as unique as fingerprints. The stripes represent the balance of yin and yang, harmony and enable us to see a deeper truth. Zebras enjoy challenge as they know that all challenges are a chance for growth. The zebras pattern of black on white, or white on black implies that what you see is not always what you get. Occult knowledge seen and unseen, dimensional shifts, new journeys and worldly endeavours are all aspects of this. Zebras seek balance in what they do, and they are sure of themselves, standing confidently in the middle of opposing forces. When the zebra comes into your life, change is signified in one or more areas of your life and hidden knowledge will be uncovered. Stand strong, develop trust and simply flow with the rhythm of a new creation. Now my question is: What have I done by changing him from his black and white self to a multi-colored zebra? Does he still have his magic? Does he still have his balance? He's no longer black and white ... he's black and pink and yellow and blue and purple. Does he like that? Looking at another site for other interpretations, I find that zebra does not like to stand out and be judged. Maybe by going to a multi-colored zebra, it's an indication that I'm ready to stand out and be judged. Perhaps the message that I like best is: The zebra will also teach you how to seek out others who are like you, finding comfort and company in groups, while maintaining your own unique identity, your pattern of stripes like a fingerprint, unlike any other. This combination of individuality within community will be a very powerful force in your life. The zebra’s gifts include seeing in black and white, clarity without filters, balance, agility, uniqueness, power, sureness of path, keeping up individuality within the herd. The zebra's black and white stripes camouflage it against predators, who often cant identify individuals in the herd. However to the herd members the patterns are unique from zebra to zebra, helping to identify one another - they are as unique as our fingerprints. Blending into a crowd without losing your individuality is one powerful aspect of Zebra. Zebras also help us to be supportive members within our communities. These abilities protect them from danger, as well as their agility and speedy. The stripes also represent the blending and balancing of opposites, yin yang, harmony - enabling us to see a deeper truth. If this is your power animal, study its ability to survive and flourish in a harsh land. Look at your relationship to the various groups in your life. Compromising in personal relationships can be challenging, but Zebras enjoy challenge as they know that all challenges are a chance for growth. Use your mental ability to work around problems and barriers, rather than confronting them - Zebra will show you how. Zebras are members of the horse family, living in small family herds made up of a stallion and some mares with their foals. Zebras mix with antelope herds, giving the Antelopes protection from predators because of the zebras alertness. People with this power animal frequently fit the shoes of a kind hearted protector of loved ones, whether family or friends. They make great therapists and are genuinely compassionate towards others. 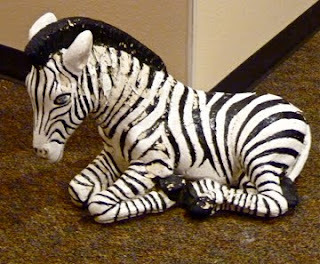 Questioning reality and illusion is common amongst people with zebra medicine, though an over analytic intellect can be a hindrance for some with this totem. In others the imagination must be awakened. The zebras pattern of black on white, or white on black implies that what you see is not always what you get. Occult knowledge seen and unseen, dimensional shifts, new journeys and worldly endeavours are all aspects of this.Zebras are master magicians, who utilise the energy of light and dark to shift realities and expand our consciousness, helping us see past our preconceived beliefs as they lead us into the mystery and magic of the unseen. Zebras seek balance in what they do, and they are sure of themselves, standing confidently in the middle of opposing forces. Those with this power animal are taught similar skills. Zebra energy will help you to take the apparently conflicting parts of your personality and weave them into a pattern which is unique, distinctive and beautiful. As a zebra, the artist within you can live in harmony with the businessperson, the spiritual explorer with the secular decision-maker, the dreamer with the practical goal-setter, neither overpowering the other, each retaining its place of importance and full expression. The zebra will teach you to honor the black and white sides of yourself without compromising yourself into a dull gray. The zebra will also teach you how to seek out others who are like you, finding comfort and company in groups, while maintaining your own unique identity, your pattern of stripes like a fingerprint, unlike any other. This combination of individuality within community will be a very powerful force in your life. The zebra energy is also the energy of physical health, long life and great stamina. Breathe in this vital source of very real physical power. Feel how you are capable of running across the plains for hour after hour, each step filling you with vibrant earth energy, so that the more you exercise, the more energized you become. Then just kick up your heals with joy, for you are the zebra, vital and alive. How fortunate you are! I think having the zebra is great. And look what you discovered! As for the change of stripe colors, let's just say it's a challenge to people's assumptions. It's a conversation starter. It's a chance to uncover possible opportunities through those conversations. It's creativity. It's a rainbow shimmering on a zebra's coat. Yes, but do zebras want to go to Italy? Are there zebras there? PS: I love your zebra, and love all it says about you and your life. Maybe you should curl up with him and ask what he thinks of Italy?